Despite the fact that I didn't adore Miss Peregrine’s Home for Peculiar Children like many readers, I still wanted to pick this book up and experience some of the folklore and mythology of the series. I'm quite glad I did because I found it really interesting! 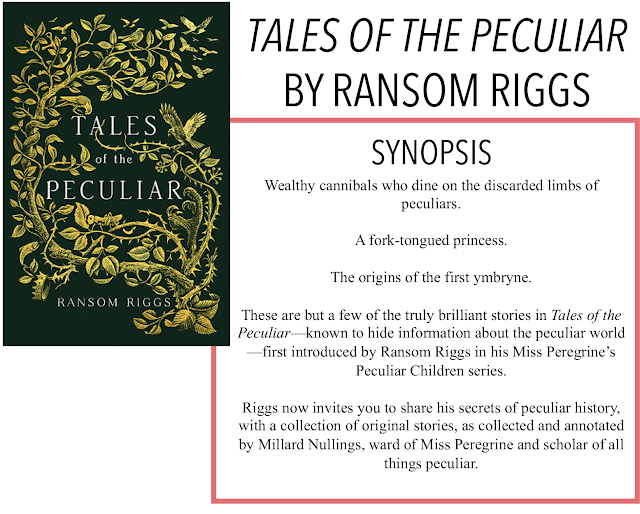 I am back with another review, Tales of the Peculiar by Ransom Riggs. Like with my other collections of short stories, I will just briefly talk about each one individually. I have a very vague memory of a man being carried around because he had no limbs in the main trilogy, so I guess that is where that comes from, if it actually happened. This was a really great story that I found fascinating. The villagers were so concerned with having the best and biggest that they lost sight of what was really important. 4.5/5 stars. This one definitely did not end how I thought it would, but I'm happy with how it turned out. The princess didn't settle for the peculiar prince just because he was peculiar, she went on to bigger and better things. 3.5/5 stars. Another story that is quite relevant to the trilogy, it helps explain time loops and why ymbrynes are able to change from bird to human and vice versa. It also gave some background on Miss Wren, a ymbryne I'm sure I remember reading about. 3/5 stars. "The Woman Who Befriended Ghosts"
I thought this was another really interesting story. I liked the ghost aspect and Riggs really shows his fantastic ability to write visually with this story. 4/5 stars. I really like when fairy-tale-esque stories like this one include real-world effects. This story is about the creation of a magical island, and mentions creating islands by Madagascar. I got almost a Moana vibe from this if that makes any sense - just the creation of islands and the life in all things. 3.5/5 stars. "The Pigeons of Saint Paul's"
Another story that includes some reality, this one talking about the Great Fire of London in 1666, and how the pigeons caused it. I also seem to recall Wren the architect in the main trilogy, but it's been a while so don't quote me on that. 3/5 stars. "The Girl Who Could Tame Nightmares"
This was a fascinating story about children and touched on themes of abuse. The boy cannot return to his human state until someone shows him love, something his father was unable to do. It's a really interesting story that, for whatever reason, struck a chord. 3.5/5 stars. "The Boy Who Could Hold Back the Sea"
This wouldn't be a true collection of fables and folklore without at least one cautionary tale about not sharing your gifts with everyone to avoid exploitation. Another story that included some historical details, this one was about a ship that hit an iceberg and sank after a greedy captain with a boat-load of Irish famine refugees jumps ship on the only life raft. 3/5 stars. Overall, Riggs shows off his tremendous storytelling abilities and depicts stories that are both interesting and relevant to the trilogy.